This August 26 to 28, 2017 long weekend, Lenovo has announced that they will hold a special exclusive flash sale of their devices at Lazada Philippines. Lenovo will put the Lenovo A1000, Vibe K4 Note, and Vibe X3 on sale. The Lenovo Vibe X3 is a multimedia centric smartphone equipped with 5.5 inch FHD screen, Snapdragon 808 chipset, 3,500 mAh battery, 21 MP cameras, 32 bit DAC audio chip, and dual front firing speakers. From the original SRP of PHP 22,099, it will be priced at just PHP 9,999. The Lenovo K4 Note is one of the best midrange devices during its time. It has a 5.5 inch screen, octa core chip, 3 GB RAM, 3,300 mAh battery 13 MP main camera, 5 MP selfie camera, Wolfson audio chip, and dual front firing speakers. From PHP 10,699, its down to just PHP 6,999. On the other hand, the Lenovo A1000 is an entry-level offering that's now more affordable than ever. From PHP 3,999, you'll enjoy a phone with 4 inch screen, 1.3 GHz quad core chip, 1 GB RAM, and 5 MP main camera for just PHP 2,199! The Lenovo Vibe X3 is even bundled with a FREE Bluetooth headset. On the other hand, the Lenovo Vibe X4 will come with a FREE VR headset. 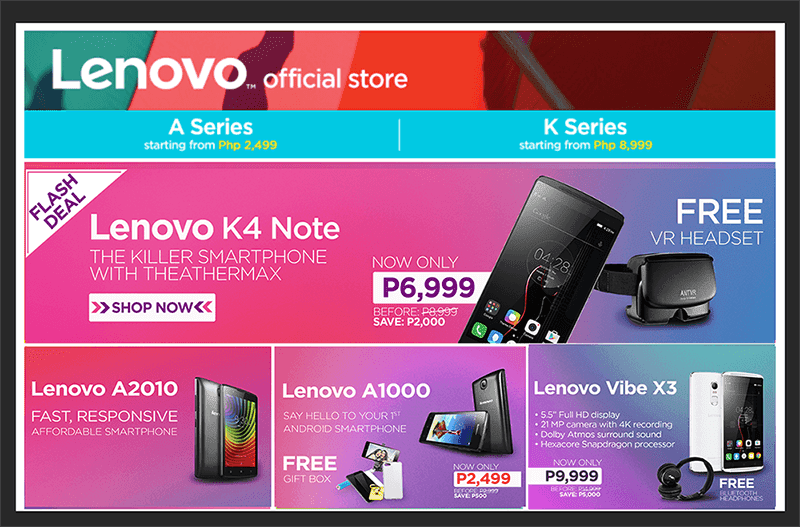 The Lenovo Flash sale starts on August 26 for Lenovo VIBE K4 Note, on August 27 for Lenovo A1000 and August 28 for Lenovo VIBE X3.